Oct. 3, 2014, 10 a.m.
LOUISVILLE, KY October 13, 2014 - This Girl Scout Cookie season, Girl Scouts will be offering a new cookie that is gluten-free. Toffee-tastic Girl Scout Cookies are crispy, buttery cookies packed with golden toffee bits. The sale of Toffee-tastic Girl Scout Cookies is a pilot program, and the cookies will be offered in 67 councils, for as long as supplies last. They will be sold primarily at booth sales. 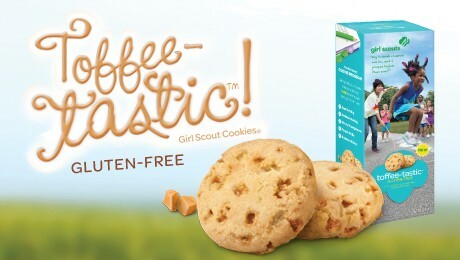 Girls are excited to offer a new kind of Girl Scout Cookie that customers are going to be eager to try. This new cookie is helping girls learn how a product is developed and brought to market. With a growing number of people avoiding gluten for a variety of reasons, Girl Scouts recognized a need for a gluten-free option for their customers. More than just a fad, gluten-free products are quickly becoming a way of life for many people. According to the National Foundation for Celiac Awareness, more than 3 million Americans (1 in 333) are estimated to have celiac disease, and market research by NPD Group reports that 29% of Americans are avoiding gluten for health reasons. Certified gluten-free by the NSF, the indulgently rich flavor of Toffee-tastics will appeal to all customers, but Girl Scouts are especially excited they can offer this option to those avoiding gluten. Net proceeds from cookie sales will remain with the Girl Scouts to supply essential services to girls. Together, girls decide how to spend their troop cookie money and reinvest it back into their neighborhoods through community service projects, travel opportunities and learning experiences. Because 100 percent of the net revenue raised through the Girl Scout Cookie Program stays with the local council and troops, customers who purchase Girl Scout Cookies are not only getting a delicious treat—they are also making an important investment in their communities. The essential 5 Skills girls learn in the Girl Scout Cookie Program are goal setting, decision making, money management, people skills and business ethics—skills essential to leadership, success and life. For more information and complete product description, please visit www.littlebrowniebakers.com. To find cookies in your area, visit www.girlscoutcookies.org.